Galloper Offshore Wind Farm is a 353MW wind farm project located 30km off the coast of Suffolk, UK. It is now in full operation and each year will generate enough green electricity to power the equivalent of more than 380,000 British homes. The construction of the wind farm created almost 700 UK jobs and its operation has created around 90 direct and indirect long-term jobs in the local area. A 60-strong team will operate and maintain the wind farm day-to-day from a base under construction in Harwich International Port. There were two main challenges of the survey which had to be overcome. The first was that each of the inter-array cables had to remain in service throughout survey operations, limiting the survey techniques capable of measuring the depth of burial of the cables. In addition to this, the cables were 33kV inter-array designs, which have a smaller cross-sectional area than other higher voltage cables. The survey was carried out from Bibby HydroMap’s survey vessel Bibby Athena, a 27.5m semi-SWATH (Small Waterplane Area Twin Hull) vessel. The vessel has a pair of iXblue HYDRINS inertial navigation systems (INS) as well as an integrated dual head Teledyne RESON T50 multibeam system. Bibby Athena is capable of DP1 operations, allowing it to deliver exceptional line keeping to accurately follow the cables. For this project, Bibby Athena was equipped with the survey ROV d’ROP and Pangeo Subsea’s Sub-bottom Imager (SBI). In addition to the depth of burial equipment, a dual-head Norbit WBMS multibeam echosounder was also mobilised simultaneously on d’ROP. Galloper Offshore Wind Farm location. The SBI uses advanced acoustics to provide a real-time view of the sub-seabed in full 3D, as a continuous longitudinal path measuring 5m wide by 7m deep of the seabed. The SBI integrates with industry standard survey software to delineate shallow discrete objects, stratigraphy and geohazards with decimetre resolution. The SBI uses beam forming and synthetic aperture processing to delineate sub-seabed stratigraphy, buried infrastructure, and buried geohazards with a depth-dependent spatial resolution that is a function of the type of seabed. Deployed vertically below the vessel through the moonpool, d'ROP derives primary positioning through a combination of the vessel's DP system and a heave compensated umbilical winch and combined Launch and Recovery System (LARS). The unit is then able to make fine adjustments to its position using the four onboard thrusters. Overall, this allows d’ROP to either stay on station or follow a set line allowing the system to operate at a fixed height above the seabed to maximise data quality. Plan view of the Pangeo SBI data. d’ROP is capable of small amounts of lateral movement away from the vessel whilst deployed, however, this is limited to approximately 10m and varies with water depth. 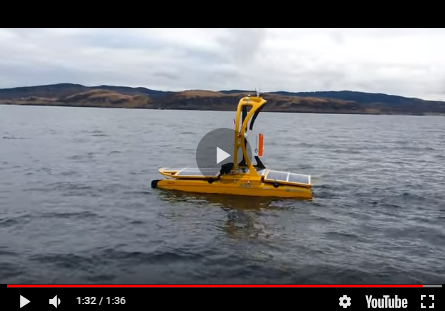 In addition to the Pangeo SBI, d’ROP can optionally be fitted with the Teledyne TSS350 cable detection and tracking system along with other depth of burial systems; HD cameras can also be utilized. The survey methodology involved a two-pass solution along each of the inter-array cables. The first pass involved utilising the vessel’s mounted integrated dual-head multibeam echosounder system to undertake a reconnaissance survey to ensure the highest levels of QHSE were maintained ahead of the deployment of d’ROP. This was to ensure the wider seabed surrounding each cable and turbine foundation was clear of any debris or hazards which could pose a risk to d’ROP, as well as assessing recent bathymetric changes. In addition, it enabled insonification of the wider area providing additional data which can be used during future comparison surveys. The second pass involved utilising d’ROP at a constant altitude of 3.5m to acquire simultaneous high-resolution depth of burial and multibeam echosounder data along each of the cable routes. Due to the required flying height and the custom mounting design of the multibeam systems, a bathymetric data corridor of approximately 20m was visualised with ultra-high resolution, with the cable at the centre, as well as a full 3D volume of acoustic depth of burial data. During operations at the Galloper Offshore Wind Farm, depth of burial data beginning from the point where the cable protection system entered burial was required – this was observed at an average distance of 25m from each WTG location. Maximum coverage was achieved using a combination of the DP system and the manoeuvrability of Bibby Athena. In addition, the high-resolution multibeam echosounder data acquired during the first pass enabled further visualisation of sections of cable before entering burial. Pangeo SBI mobilised to the d’ROP skid. Over 140km of SBI data was acquired over the 56 inter-array cables at the wind farm throughout the survey. The acquired SBI volumetric data was processed within Pangeo’s ‘Pilot Console’ software package, and then in-house interpretation was carried out using EIVA Navimodel. All multibeam data was processed in-house utilising QPS Qimera software. The SBI data was rendered at a voxel (3D bin) resolution of 10cm3 to ensure the cables were identified accurately. The 3D sub-bottom images were analysed, and the acoustic response of the buried cables were used to identify the top of the cable. On this particular site, seabed conditions and the geological makeup of the site meant that some regions exhibited a very hard seafloor with the presence of cobble clusters, limiting the amount of acoustic energy able to penetrate down to the cable and giving rise to frequent acoustic anomalies requiring additional processing and interpretation which was also completed in-house. In addition to the required data, it was also possible to provide information on which occurrences were located very near to the cables for future reference. There was no evidence of such anomalies impinging directly onto any of the cables, so it is thought that the cobbles must have been pushed aside during cable installation. d’ROP console with a view of Galloper’s sister project Greater Gabbard from the bridge of Bibby Athena.